Six days after a win that some say they stole, the Seahawks Sunday were tricked and not treated in St.Louis by the Rams in a 19-13 setback that sits them at 2-2 on the young season. Rams rookie kicker Greg Zuerlein, from Missouri Western State, kicked four field goals, including a Rams franchise record 60-yarder, as the Hawks were no match after their emotional win over the Packers. Zuerlein also hit from 58, 48 and 24 yards, and has not missed a field goal try in his young NFL career, going 12- for-12. Sam Bradford threw for 221 yards on 16-of-30 passing in the win, while Stephen Jackson, who was questionable during the week due to a groin problem, ran for 55 yards on 18 carries. Danny Amendola caught six passes for 55 yards and a touchdown for the Rams (2-2), who bounced back from a loss to the Bears last week. Punter Johnny Hekker threw a touchdown pass on a fake field goal in the victory. 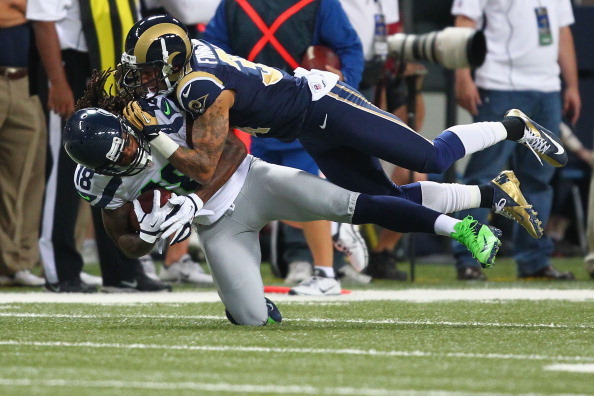 Marshawn Lynch led Seattle with 118 yards on 20 carries, including an 18-yard score on the game’s first possession. The Rams intercepted Russell Wilson three times, the clincher coming from Bradley Fletcher at the Rams 25 with a minute to go. Wilson had just one pick the first three games but Pete Carroll was pretty happy with the rookie’s play, noting wide receiver Anthony McCoy slipped and fell on Fletcher’s interception. Steven Hauschka kicked two field goals and Sidney Rice led the receiving corps with four catches for 41 yards in the setback. Trailing by six, the Seahawks began their final possession of the game at the 20-yard line with no timeouts and 3:09 on the clock. Wilson led his team down to the St. Louis 35, but was picked off by Bradley Fletcher, and the Rams ran the remaining time off the clock.